We are a distinguished Tour Operator Jalandhar, Punjab, and we cater to provide the clients with wide variety of cars on rent for wedding purpose. The cars provided by us, are well-maintained and ensure smooth traveling experience. 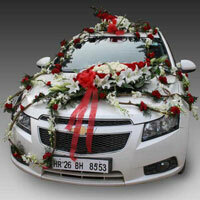 We can provide Wedding Car Rental Services as per the taste & preferences of the clients. Apart from this, we can also provide decoration for the cars according to the clientâ��s requirement. Moreover, we make the cars provided on rent are well-maintained and ensure total comfort to the traveler.